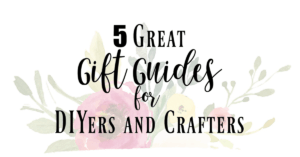 I’m so excited to be joining in with Meg from Green with Decor and all these other lovely ladies to share with you our green decor. 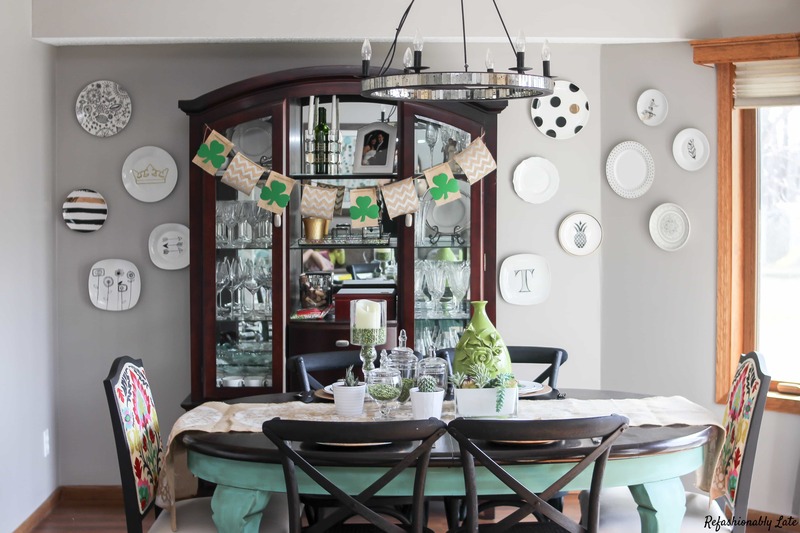 We are opening up our homes to you and sharing our mantles, living spaces, tables and more all in celebration of the upcoming St. Patrick’s Day. If you aren’t new here then you know how much I love a good tablescape. I love creating different tables for the different holidays. 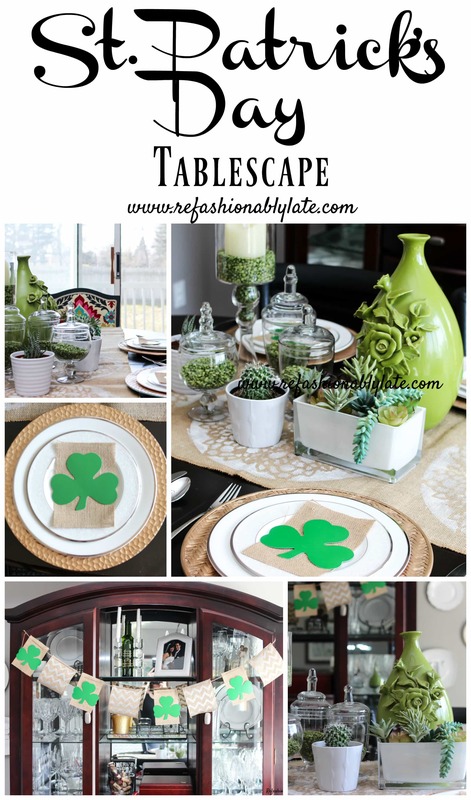 I thought it would be fun to make a table with some touches of green. I started with a burlap table runner that I made a couple years ago. 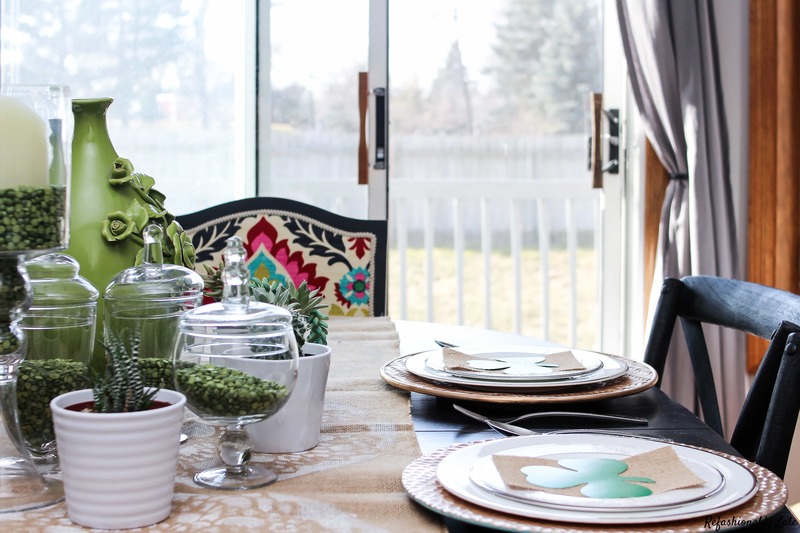 I absolutely love this table runner because it looks great with so many different decor choices. I’ve used it with a Christmas tablescape , a candle lit fall tablescape , and another fall tablescape. 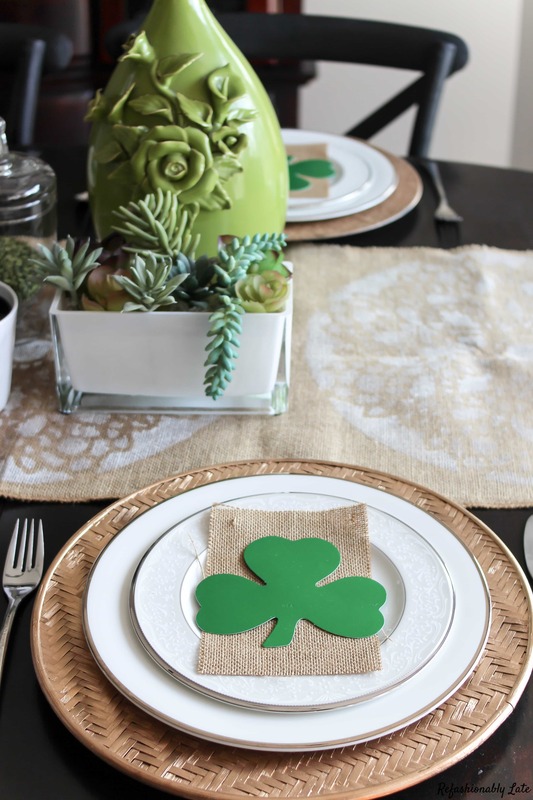 It’s one of my favorite tablescape DIYs and can be used for so many reasons! 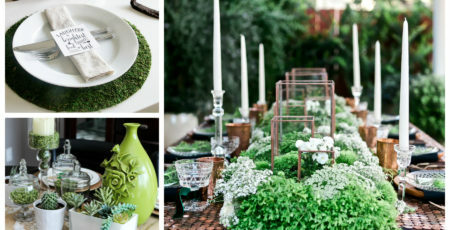 One of my favorite things to do when creating a tablescape is to go “shopping” around my house. I gathered a few apothecary jars and a candle holder. I filled them with split peas (which I did purchase) and then added a Luminara Moving Wick Flameless Candle. My absolute favorite flameless candles! They look realistic and their battery life is amazing! I then added the green floral vase, faux succulent planter and these two succulents from my Hanging Succulent Planter . 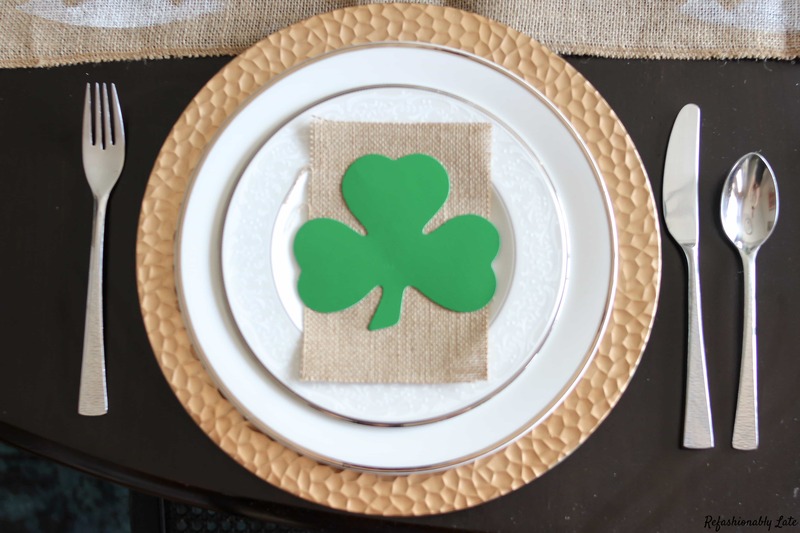 I also purchased these cute Shamrock Cut Outs from Amazon where I made a quick St. Patrick’s Day Banner ( tutorial here) and used them also on the place settings. 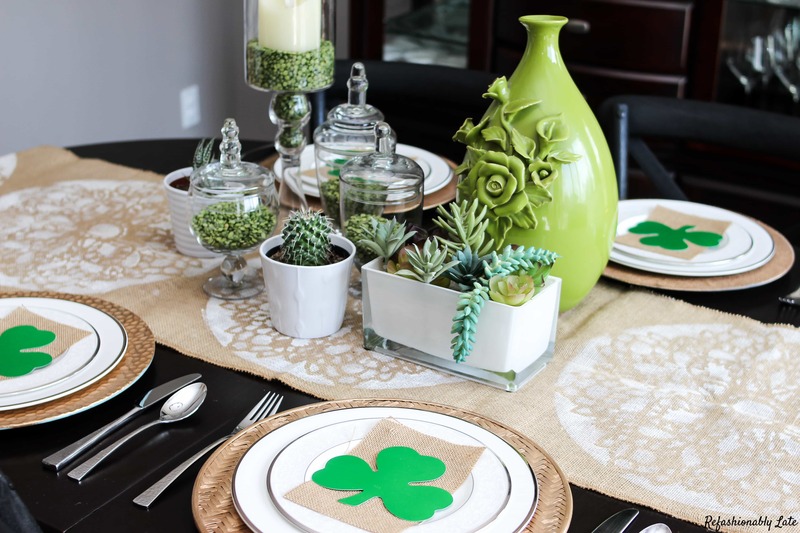 I owned everything for this tablescape besides the shamrock cut outs and the split peas! So for about a total of $7 I created this table! It was so quick and easy and I love the way it looks! I love when a table really ends up simple and gorgeous and even better yet….affordable!! 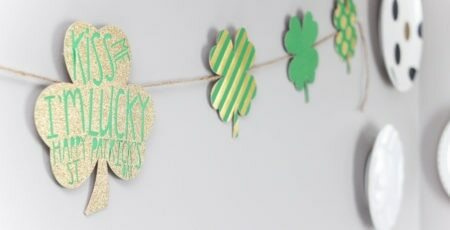 Thanks for stopping by and make sure to follow all the rest of the lovely ladies below and see their beautiful St. Patrick’s Day decor! 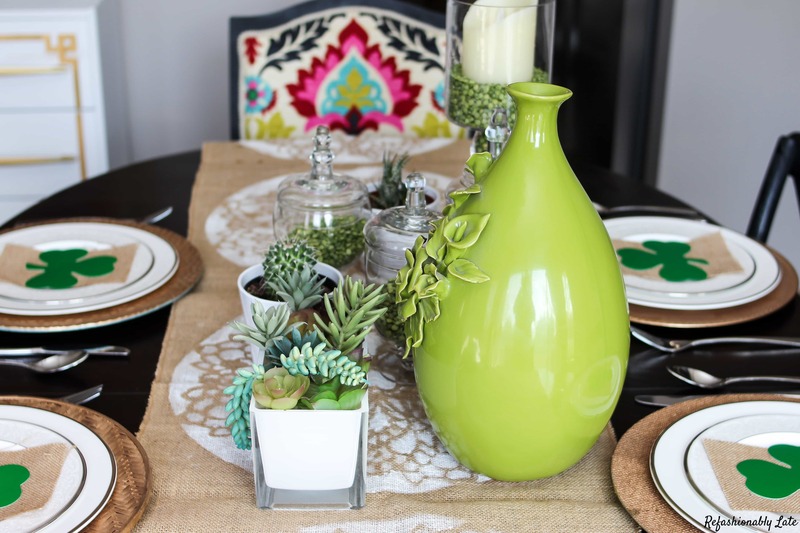 Such a pretty green dining room! Ready to welcome spring! Hopefully it will help bring Spring here! We are sure ready for it here in Minnesota! I feel such a sense of accomplishment when I create something for a small price!! And yes shopping around your house is the perfect way to do so! 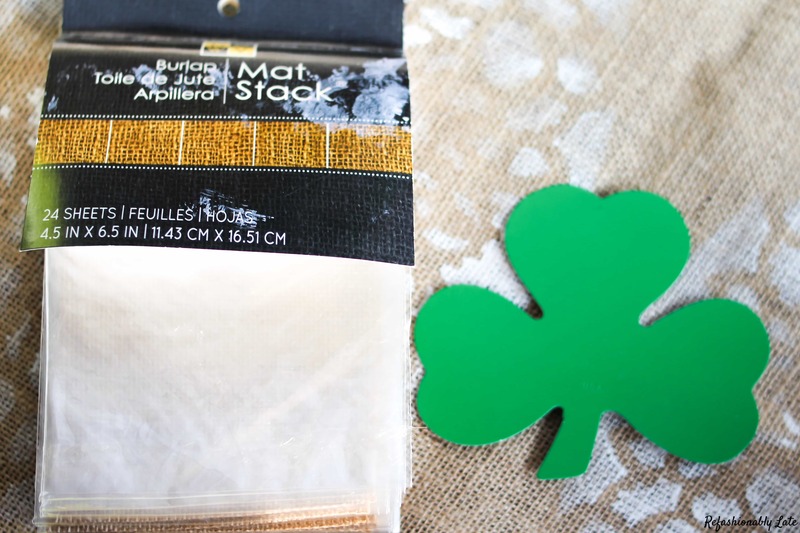 What a great idea to use split peas as a filler. So colorful and such great texture! I’m pretty much in love with your table runner.. it’s on my to-do list one of these days. Such a fun and festive table! Very cute! 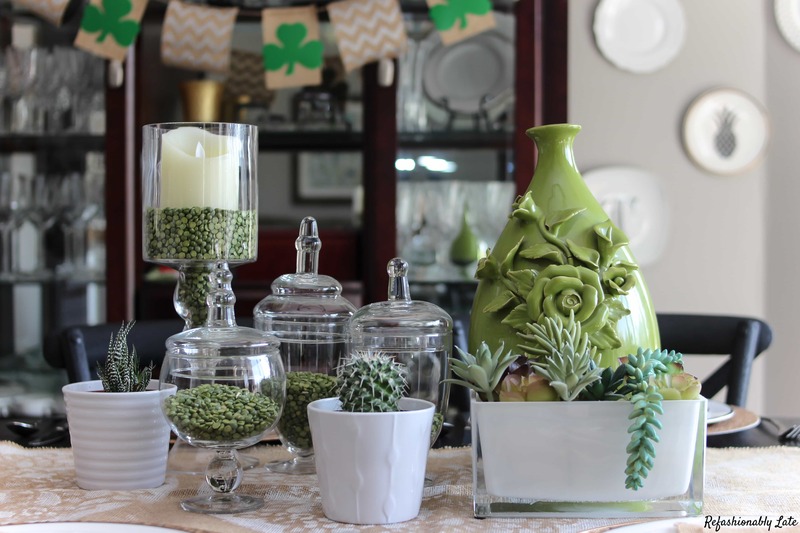 I love how you mixed the different plants in the center – even a cactus! Your tablescape is beautiful, Ruthie! 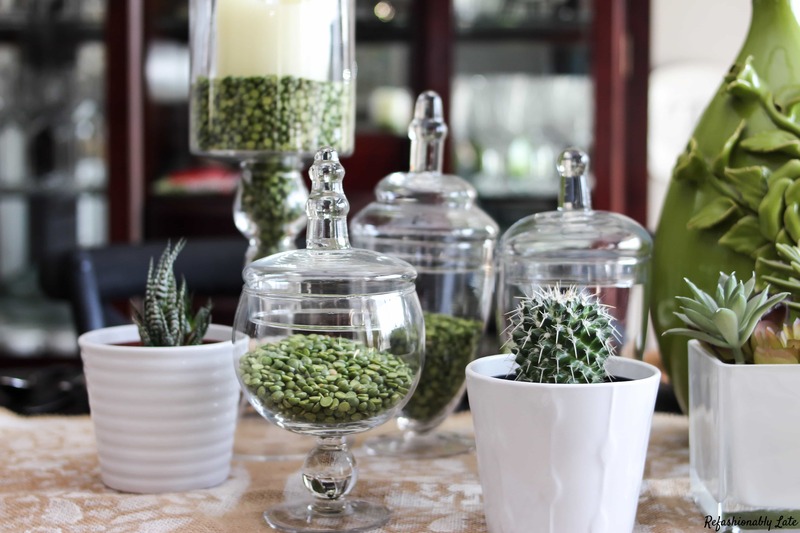 I love all of the apothecary jars! Thank you so much Erin! 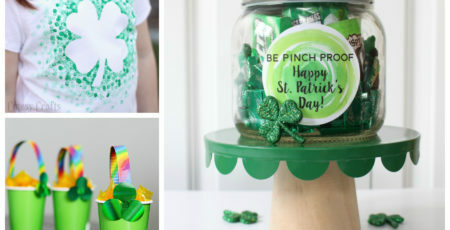 I don’t feel like St. Patrick’s Day is always a “pretty” holiday so I love that we can share that it can be! This is so festive, I love it!! 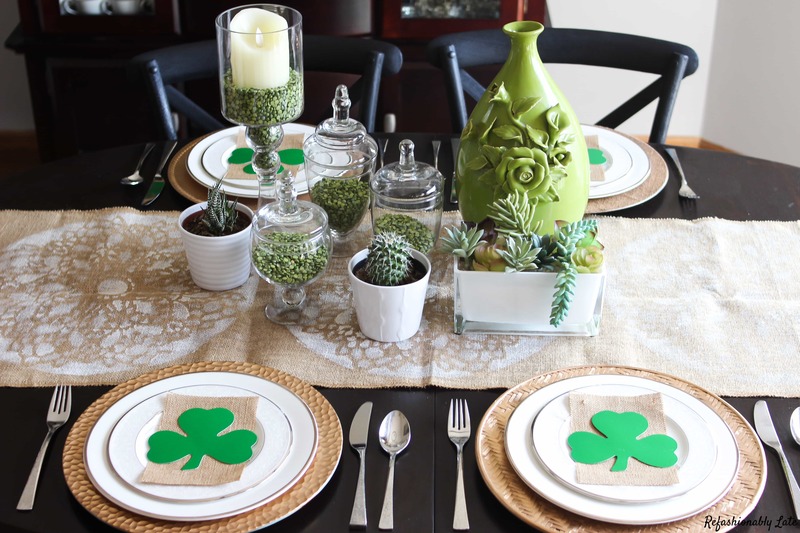 Those shamrocks are perfect for the banner and the table, and I love how you included succulents! Thanks for joining the tour! Thanks for hosting Meg! 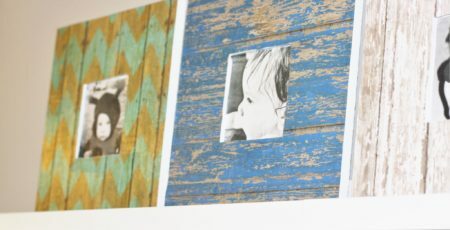 It was fun to work outside of comfort zone as I don’t use green very much in my decor! I love how it turned out!